The Webley Raider has always been a popular PCP rifle amongst shooting enthusiasts thanks to its high quality barrel and expertly made action. The Quantum upgrades the Raider by introducing a full length barrel silencer which vastly reduces muzzle report and makes the Quantum one of the best priced hunting rifles on the market. 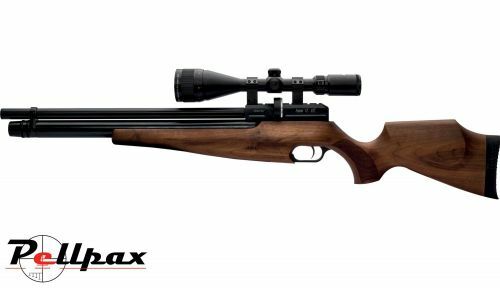 This rifle shoots at around 11.5ft/lbs and is chambered int .22 calibre making it more than enough to deal the toughest garden pests such as rats or rabbits. The rifle features a sporter shaped walnut stock that is chequered for enhanced grip and has been stained for deep colouration and great aesthetics.